The global technical ceramics market was valued at US$ 84.33 Bn in 2018 and is anticipated to expand at a CAGR of 6.68% from 2019 to 2027, according to a new research report titled ‘Technical Ceramics Market: Global Industry Analysis, Size, Share, Growth, Trends, and Forecast, 2019–2027,’ published by Transparency Market Research (TMR) The global technical ceramics market is driven by the rise in demand for technical ceramics in medical and electronics sectors across the globe. In terms of demand, Asia Pacific accounts for dominant share of the global technical ceramics market. Consumer electronics is a leading and rapidly expanding industry. The global electrical & electronics equipment industry was valued at more than US$ 2.8 Trn in 2017. Demand for electrical & electronics equipment is expected to increase at a significant pace due to the rise in need for smartphones, laptops, tablets, and portable electrical appliances. The usage of technical ceramics has been increasing in the electronics industry due to their excellent electrical insulation properties that allow them to be used in microchips, circuit boards and circuit breaker technology, ceramic substrates, circuit carriers, and core materials. Demand for technical ceramics in the consumer electronics industry is expected to rise steadily during the forecast period. China has become the hub of electronics production in Asia Pacific since the last few years. The electronics industry is strongly dependent on macroeconomic developments and government activities. The Government of China plans to invest US$ 150.0 Bn in the electronics industry over the next few years to strengthen its position in the market. Thus, strong government initiatives and need for high-quality electronic devices have boosted the demand for technical ceramics that are used in consumer electronics. Japan is estimated to record positive growth in sales of consumer electronics due to the high demand for products such as capacitors and resistors. The recent ‘Make in India’ government campaign has encouraged companies in India to lower imports and develop quality products. This is projected to fuel the demand for technical ceramics in the country. Furthermore, emphasis on digitization and strong foreign direct investments (FDI) are likely to propel the electronic sectors as well as the technical ceramics market in India. Technical ceramics require machining to obtain a specific shape and size of a component before its usage in end-use industries. This entails high capital cost, which is hampering the technical ceramics market. Technical ceramics are generally used in major applications including chemical, mechanical, and consumer products. Currently, diamond wheel grinding is the only method available for machining technical ceramics. However, this production process is not suitable for small scale plants, as it requires high capital cost and highly qualified workforce. Therefore, technological development needs to take place in machining methods in order to minimize the cost of machining technical ceramics. Another factor that influences the cost of technical ceramics is the unavailability of any data on the machinability of technical ceramics. Machining costs of technical ceramics should decline with the increase in volume. Innovation allows costs to decrease further. Thus, high machining cost is hampering the global technical ceramics market. In terms of material, the technical ceramics market has been bifurcated into oxide ceramics and non-oxide ceramics. The oxide ceramics segment comprises alumina ceramics, titanium ceramics, zirconium ceramics, and others (including magnesium oxide and sintered fused silica), while the non-oxide ceramics segment consists of alumina nitride, silica nitride, silica carbide, and others (including boron carbide and silicon aluminum oxynitride). Among oxide ceramics, zirconium oxide was a rapidly growing sub-segment of the technical ceramics market in 2018, as zirconium oxide provides oxygen ion conductivity, high fracture toughness, and good tribological properties. Based on product, the global technical ceramics market has been divided into monolithic ceramics, ceramic matrix composites, ceramic coatings, and others (including multilayer ceramics and advanced coatings). The ceramic matrix composites segment expanded at a rapid pace in 2018. The segment is likely to remain highly lucrative during the forecast period, due to the rise in demand in the automotive industry, as ceramic matrix composites overcome the major demerits of monolithic ceramics such as brittle failure, low fracture toughness, and thermal shock resistance. Based on end-use industry, the global technical ceramics market has been segregated into electrical & electronics, medical, automotive, energy & power, and others (including chemical products and consumer products). Electrical & electronics was a highly attractive segment of the global technical ceramics market in 2018, led by the rise in demand for technical ceramics in semiconductors, resistors, and capacitors. Technical ceramics are employed significantly in the medical sector, as they provide natural color to the teeth. 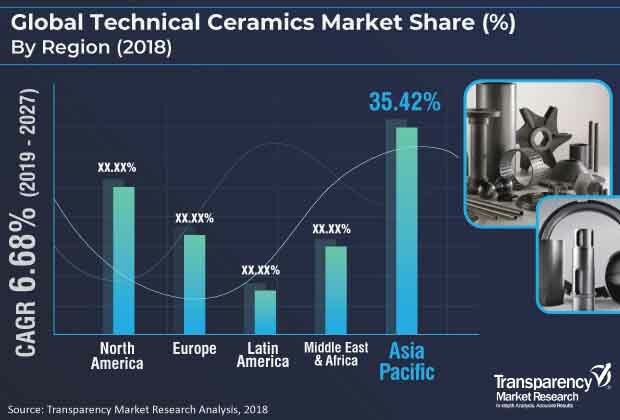 Based on region, the global technical ceramics market has been classified into North America, Europe, Asia Pacific, Middle East & Africa, and Latin America. In terms of value and volume, Asia Pacific was a leading region of the global market in 2018. The market in the region is anticipated to expand at a rapid pace during the forecast period, owing to expansion in automotive and electronics industries and presence of major manufacturers of technical ceramics in the region. High industrial growth resulted in an increase in demand for technical ceramics in different applications such as wind energy and medical. This growth is further supported by the expansion in the military & defense sector in Asia Pacific due to the rise in government investments in the defense sector. Europe and North America are significant consumers of technical ceramics. The technical ceramics market in Latin America is projected to expand at a moderate pace during the forecast period, as demand for technical ceramics in these regions is anticipated to rise in the next few years owing to the expansion in the automotive industry. The market in Middle East & Africa is expanding at a medium pace. In terms of demand, the technical ceramics market in Middle East & Africa is one of the most dynamic ones across the globe. There exists high demand for high quality, high-priced technical ceramics. Simultaneously, there exists demand for economical and cost-effective products. The degree of competition among players operating in the technical ceramics market in China is high, due to the presence of a large numbers of companies producing technical ceramics in the country. Key players operating in the global technical ceramics market are 3M, Morgan Advanced Materials, CeramTec, Kyocera Corporation, Saint-Gobain Ceramic Materials, NGK Spark Plug Co., Ltd., Imerys Ceramics, Superior Technical Ceramics, Rauschert GmbH, McDanel Advanced Ceramic Technologies, Dyson Technical Ceramics, and CoorsTek Inc.